I still think that Valerie Saving was right. It’s been 56 years since she published her article on “The Human Situation” in The Journal of Religion, and her most basic groundbreaking insight holds true: Under patriarchy, the fundamental sin and danger for women is not too great a sense of self, too much pride as Reinhold Niebuhr would argue; rather, the problem is too small and diffuse a sense of self. Prioritizing others ahead of herself, the woman under patriarchy accepts second-class citizenship and submission to male headship as her rightful place. Yet, in recent years, when reminding colleagues of this fundamental feminist insight from the second wave, I have received replies that begin “But Sarah Coakley says ….” What they lift up is Coakley’s supposed reclamation of kenosis as feminist, of self-emptying as a revolutionary Christian act in relationship to God. To them, this corrects Valerie Saiving. I have heard variations on this defense from senior male scholars who believe themselves to be quite advanced in their thinking, as well as from female scholars who believe this is the kind of feminist theology they want. 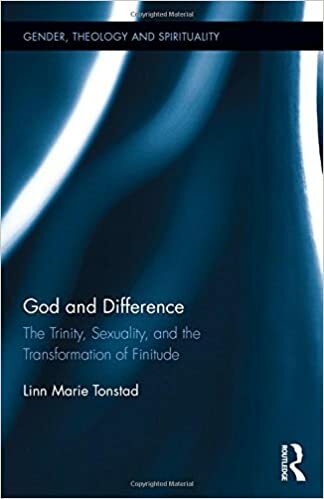 Fortunately, for her new book God and Difference: The Trinity, Sexuality, and the Transformation of Finitude, Linn Marie Tonstad read every word Sarah Coakley has written so you don’t have to. Tonstad expertly shows in chapter three what Coakley’s argument is, and how it fails to escape masculinist and patriarchal ideology. The book is an important new work in Christian systematic theology that successfully employs queer theory to reconstruct Trinitarian theology. “a way to enjoin practices of sacrifice and submission under the banner of countering the rapaciousness of modern subjectivity. The accompanying articulations of Trinitarian personhood reflect deeply gendered and misguided assumptions about human and divine personhood.” (p.1). As the title of the book suggests, Tonstad is keenly interested in thinking about difference and how, if at all, the Christian concept of Trinity is usable as a way to see difference as inherent in deity itself. In short, gender gets in the way. More specifically, patriarchal social constructs of masculine and feminine so shade our understanding of difference that we are urged to break them open in order to get a richer, deeper, and more compelling understanding of God and difference. Enter Sarah Coakley. Echoing my own recent experience, Tonstad points out that Coakley has become “the favorite feminist of those theologians and analytic philosophers of religion most hostile to or uninterested in gender concerns.” (p.98). On the contrary, in a theology where “the human being becomes the Son” and the God-world relation is thus symbolically (homo? )sexed, gender concerns are nothing if not primary. Not only that, a deeply problematic kind of gender- and power-relations are embedded in Coakley’s theology. “divine threeness ‘ambushes’ human twoness, incarnation ‘transgresses’ the difference between God and creation, and creation’s dependence on God is redefined as vulnerability and submission. … The contemplative (alone) names the Father rightly as she overcomes patriarchy ‘on her knees.’” (p.99). In addition, God becomes “the only Other to whom the human being can submit with no safe word.” (p.100). For anyone attentive to gender justice in theology, the problems with Coakley’s work quickly become apparent. Tonstad’s thorough analysis of her themes and arguments are unmatched in academic conversations today. But if you come to this book for its critique of Coakley (*raising my hand*), stay for the constructive proposals that make use of queer theory to open up new paradigms in Trinitarian theology. Quoting Marcella Althaus-Reid, Tonstad explores difference within deity: “Queerness is something that belongs to God, and people are divinely Queer by grace.” (Queer God, 34). She also employs Althaus-Reid’s idea of a destabilizing omnisexual kenosis, inverting the power dynamic with “the necessity for humans to lead God astray.” (p.140). “If we no longer arrange ourselves kneeling around god’s Son-phallus or the priest-theologian’s asymptotic possession of it, we will no longer gag on God’s fullness nor be forced to swallow an eternal emission. Instead we may find there already the differences of pleasures ‘outside the law.’” (p.141). The terms might not be those that were available to Valerie Saiving in 1960, but the insight into how gender shapes experiences of God and being human remain. What is offered up as a model of the God-world relationship for cisgender heterosexual white men and their supporters is experienced as violence and violation by those who live outside and beyond patriarchal identity boundaries. Linn Tonstad’s book has so much more to offer than this as a substantial and comprehensive work in queer theology. Insofar as our understanding of difference affects Trinitarian theology, it inevitably affects our concept of God, of the God-world relationship, and our relations with each other with all the big and small political and social issues embedded therein. God and Difference is one of the latest volumes in the Gender, Theology, and Spirituality series, published by Routledge and edited by Lisa Isherwood. Thanks for this brilliant review and critique of Sarah Coakley’s theology of submission. What is really disturbing in what you say is that it seems that she is being “embraced” as the voice of a true Christian feminism by all too many of the powers that “be.” Quite a slap in the face to anyone who really cares about feminist theology!!! Well sure, if the only alternatives are egotism, selfishness, and destruction of the other, submission “might” have something going for it. But this is to deny a whole range of relational worldviews, both indigenous and present day, including process and ecological theologies. Duhhh, haven’t feminists, ecologists, and others been writing about power of being, and power with, and the interdependence of life as alternatives to the hierarchical dualism of self and other? More power to you and Linn!!! I know. I have been utterly unable to respond effectively when folks have tried to claim Coakley as a feminist and as a “corrective” to Saiving et.al. … partly because I find it strange and partly because I hadn’t the benefit of Linn’s great deconstruction here. PS The Goddess I know and love does not want me to “submit” to Her will. She wants me to join with her in feeling the feelings of others and doing what I can to promote the flourishing of the world–the flourishing of self and others, human and other than human. The best way to do this is by standing on my own two feet–and no I don’t have to use them to trample on others, for instead I can join with others in the dance of interdependent life. My goodness Caryn, you have really gotten me going!!!! And riled me up!!!! Love to see you riled up any day, Carol! If we could simply understand Nature as deity, as existence, the cosmos, the human condition, we would understand immediately the continuity of it all. The division of separating Nature off from religion is where in the centuries of our theistic evolution we completely lost our Way. I’m wondering why we have created an image of the “One we call God” as three “persons” and then spend so much time trying to figure it out or change it while staying with the Trinitarian idea. Carol’s description of Goddess mirrors my own understanding of the Creator. Perhaps we make it all too complicated? Great review, Caryn. What Tonstad seems to be saying reminds me of Rebecca Parker in her co-authored volume _Proverbs of Ashes_. Parker uses story more than systematic theology to make her point, demonstrating that as portrayed by trinitarian theology, the relationship between God and His Son is abusive, since God sent Jesus into the world to be abused and murdered. This shows a trinitarian complicity with violence, whether the violence of the exclusion women or LGBTQ folks or the violence of perpetrator and victim. Parker’s question then becomes “What are the ways of being with one another that enable life to flourish, rich with meaning?” Not a theology of sacrifice (cf. Valerie Saving), which suppresses the virtue of revolt. Not atonement theology, which leaves the abused child or battered spouse defenseless. Even Jesus bears the marks of the unresolved trauma of his death within this theology. Sacrifice and submission only let the perpetrator off the hook within such a theology. Caryn, thank you for writing this. I too am sickened by the whole idea of submitting to God’s will. That sounds like abuse to me. I agree with Nancy that any God who would send Jesus into the world to be a sacrifice is an abusive God. A few years ago it dawned on me that I didn’t want to worship a God who would do that! So I ditched that idea and the idea of the Trinity. My view of God/dess is now much more aligned with those of Carol and Sarah now.